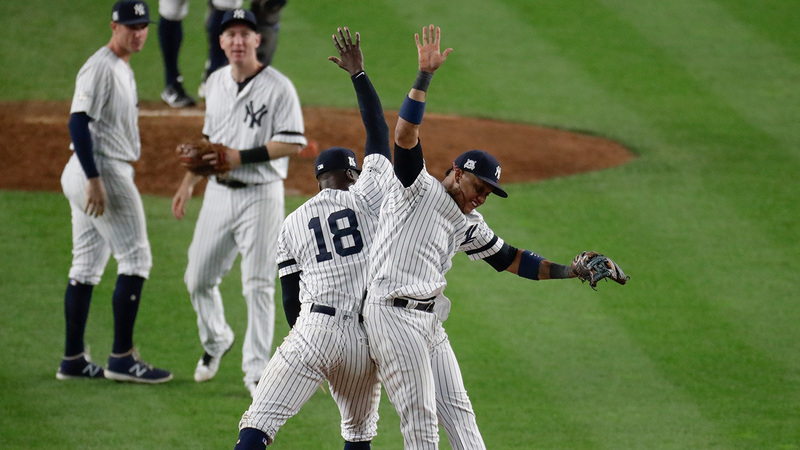 NEW YORK (WABC) -- The last chance to make it to Houston on time for the Yankees-Astros game was a 2 p.m. United flight out of LaGuardia Airport. Those who made it had to go straight to Minute Maid Park from the airport. Kyle made it. "I work a lot in Texas, so I have a friend who has season tickets to the Astros," he said. "My friend came up here for Game 5, I'm going there for six and seven, if we need it." For those not lucky enough to have friends in Houston, Foley's Bar in Midtown may be a good Plan B. It is a cathedral to baseball, where "60 feet, 6 inches" is a more revered number than 300 cubits by 50 cubits. (Just try throwing a baseball 300 cubits.) It will be packed with Yankees fans watching on big screen TVs amid a virtual museum of autographed baseballs and signed pictures, like one from David Cone's Perfect Game. "To Foley's," Cone wrote. "You're perfect." And he may be right. At Foley's, they have become smitten with the surprising and suddenly surging Baby Bombers. Most there seem to think folks with Game 7 tickets will end up returning them for a refund. "Yankees in Six," shouted one bartender, drawing a beer.